Both the Southbend G and SL-Series convection ovens are efficient. The two Energy Star rated ovens now include Southbend’s new NRG System making them an even more efficient oven. The NRG fuel saving system is designed to maintain the power of the 90,000 and 72,000 BTU convection ovens respectively, while reducing operational costs by 37-40% compared to previous models. The NRG system works with both natural gas and propane ovens. Southbend Convection Ovens that take advantage of the NRG system feature an NRG Rear Controller. The controller uses a patented damping system. When the oven stops calling for heat, the controller chokes down the flue, retaining heat inside the oven cavity instead of pumping it out the flue. With more heat retained within the cavity, the oven calls for heat less often, retaining heat for longer cycles and consuming less energy. It also adds slightly more pressure in the cavity, driving more heat into the product. Depending on the fuel source, the NRG System can save operators over $800 in operating costs in the first year. 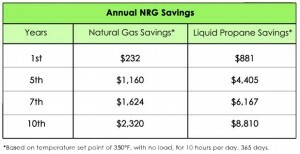 See the chart below to calculate savings with the NRG system. Get email updates about new products, auctions and more!